A stereotype for every continent. Except Australia. And Antarctica. Soldier: We're all Americans here! Miss Pauling: Well, not all of us, obviously. Medic's German and Heavy's from Russ— Ow! What? Oh. Heavy: (nervously) Ha ha! Germany! Russia! Is big joke! Big American joke on Soldier! Ooh, America. It is the place I am from. All the time. A Multinational Team is a group of characters with different, emphasized nationalities with an In-Universe justification for this diversity. They are almost invariably the good guys, although the bad guys might have their own version of a multinational team. The trope can occur in works of fiction that do not take place in the present or even on Earth: in The Lord of the Rings, for example, many diverse people from all over Middle-Earth band together. The characters are explicitly from different nations, not merely different ethnicities. If the diverse characters all grew up in the same suburban town, they are the Five-Token Band, not the Multinational Team. The team has been assembled for a specific purpose, usually by an independent party. If the diverse characters have no specific reason to be hanging out, again they are the Five-Token Band. In other words, the Multinational Team explains why the team is diverse, whereas the Five-Token Band simply is diverse, often with no explanation. This is not to say that such teams are incapable of tokenism or stereotypes. They're simply different breeds of trope. Note that "emphasized" does not necessarily mean "thrown in your face every five seconds." If the series makes enough references to the characters' nationalities for the viewer to be aware of it, then the nationalities have been emphasized. Compare the villainous counterpart, Equal-Opportunity Evil. If it's people with power, it's likely a Cosmopolitan Council. Compare/contrast Five-Token Band. This trope puts the heroes on the "heterogeneous" side of Alike and Antithetical Adversaries. In the Deva Series, the students at Hayate's academy are deliberately chosen from nations the world over. The Circles also have members from lots of nations. In the Total Drama fanfic Keepers of the Elements, each Keeper is usually from a different country. The three evil ninjas from the My Little Pony: Friendship Is Magic fanfic Flutterspy. Red Adder is from Stalliongrad, Blue Cobra is from Trottingham, and Yellow Viper is from Okineighwa. Although none of them are of Earth, the Heralds of Dawn from the Kingdom Hearts fic Re:Flection Scenario, are based on a Phenotype Stereotype associated with the compass point they are named after: Norius has Northern/English/Norse long blond hair and blueish-grey eyes. Weselo has Western/Latin American olive skin and wavy dark hair. Easen has Eastern green hair styled similar to a Hime Cut and his uniform takes inspiration from Chinese hanfu. Souzi has Southern/African dark brown skin and red hair in a buzz cut. Being a multinational corporation, The Company's mission in Event Horizon: Storm of Magic to the star system features characters from all over Earth, including Fred Kovacs (Canadian/American), Daniel Zimmerman (American), Angela Cheong (Korean), James Lombardi (Italian-American), Akane Saito (Japanese), Silke Mertesacker (German), Katherine Chakwas (Afro-British), Cristina Di Stefano (Italian-Argentine), James Wong (Chinese), Robin Van der Merwe (South African), and so on. The author of Chrysalis Visits The Hague seems to have made a point out of hardly any two characters being from the same country, with exception of the Equestrian ponies and some Dutch natives. The Pieces Lie Where They Fell: Three of the Bearers were born (and grew up) in the Equestrian continent; Night Blade in Canterlot, Rex in the Under before moving to Middle Canterlot as an adult, and Page Turner in an unknown location before going to Canterlot when very young, while Xvital is an Ahuizotl visiting from the Cuanmiztl Kingdom, Vix-Lei is a minotaur visiting from the Minos Islands, and the griffon Wind Breaker grew up in Canterlot (but, as revealed in the sequel Picking Up the Pieces, was born in and kidnapped from the Griffish Isles and taken back to Canterlot when he was too young to remember). The Ragged Edges focuses on the Imperial equivalent; a Guard regiment assembled from last-surviving members of other regiments from across the galaxy. GogolBordello were formed in America by the Ukrainian Eugene Hutz and have featured several Russians, Romanians, Israelis, Americans, English, Scottish and even a Scottish-Chinese member amongst their ranks. Russians will insist that they're an American band, however on account of being formed there. Ladytron consists of a Scot, Bulgarian and two British members (one of them of Chinese descent). Hows this for a multinational team? No Devotion is a Welsh rock band (though one of them is English) fronted by an American. Girl Group G.R.L. consisted of three Americans, one Brit, and one Canadian. Arcade Fire consists of five Canadians and two Americans. The Rolling Stones are this nowadays, with its primary lineup consisting of Brits and its touring lineup consisting of Americans. Ozzy Osbourne and his touring band consists of two Brits (including himself), two Americans, and a Greek. Foreigner was formed with Britons Mick Jones, Ian McDonald, and Dennis Elliot along with Americans Lou Gramm, Al Greenwood, and Ed Gagliardi. In fact, the band was named such because the band members were from different countries. Garbage consists of Americans Steve Marker, Duke Erikson, and Butch Vig and Scottish lead singer Shirley Manson. DragonForce is made up of English Marc Hudson on vocals, French Frédéric Leclercq on bass, Hong-Konger Herman "Shred" Li on guitar, Ukrainian Vadim Pruzhanov on keyboards, English-born New Zealander Sam Totman on guitars, and Italian Gee Anzalone on drums. Former members include South African vocalist ZP Theart, English bassist Adrian Lambert, and Scottish drummer Dave "Compact Dynamo" Mackintosh. The current lineup for the London-based power metal band Neonfly consists of Irish vocalist Willy Norton, Mexican-French guitarist Frederick Thunder, English guitarist Andy Midgley, French drummer Boris le Gal, and Channel Islander bassist Paul Miller. Midgley's predecessor as rhythm guitarist was the Irish-Filipino Patrick Harrington. Jazz unit Hiromi Uehara Trio Project consists of its namesake Hiromi Uehara (Japanese), Anthony Jackson (American), and Simon Phillips (British). Conquer Divide: All members are Americans, except for guitarist Izzy, who is British. Boy Band CNCO, born of a Latin American talent show, has five countries represented in its lineup: Ecuador (Christopher), Cuba (Erick), Mexico (Joel), Dominican Republic (Richard) and Puerto Rico (Zabdiel). Dschinghis Khan began with two Germans, two Hungarians, a South African, and a Dutchwoman. Equinox, a supergroup (or "common framework") specifically formed to represent Bulgaria at the 2018 Eurovision Song Contest, featured three Bulgarians and two Americans. Indie band Superorganism are a London-based group consisting of eight different members: Orono Noguchi (Japanese), Harry (English), Emily (Australian), Robert Strange, Tucan, Ruby, B (New Zealanders), and Soul (South Korean). It gets even trickier when you learn that Orono was based in Maine, while Harry and Emily were based in New Zealand, while Soul currently resides in Australia due to an expired work visa. WWE's short-lived League of Nations stable featured Irishman Sheamus, Bulgarian Rusev, Englishman King Barrett and Mexican Alberto Del Rio. In fact, Barrett's previous stables, The Nexus and The Corre, also were multinational teams. All Nexus members were Americans except for Barrett (English) and Justin Gabriel (South African). Later, during CM Punk's stint as the Nexus frontman, it also boasted Welshman Mason Ryan. The Corre featured Barrett (English) and Gabriel (South African) alongside Heath Slater (American) and Ezekiel Jackson (Guyanese). Journey Into Space: The crew is British (Jet Morgan and Lemmy Barnet), Canadian (Doc Matthews) and Australian (Stephen "Mitch" Mitchell). Like their "real" comic book counterparts (see above), the transformed T-Girls of the Remix Comic version of Jet Dream are an international team. In this version, J.E.T. D.R.E.A.M. operates under NATO supervision, and all the T-Girls are citizens of NATO countries: "Jet Dream Queen" Harmony Thunder (USA); Petite (France); Marlene (West Germany); Ting-a-Ling (UK colony of Fiji); Cookie Jarr (Norway). The book-hunters from Stand Still, Stay Silent have Finn, Norwegian, Swede, Dane and Icelander members, making them an omninational team by the standards for the Known World . 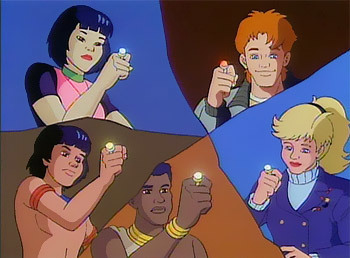 The Global Guardians, from the Global Guardians PBEM Universe are more or less this, depending on their lineup. The final lineup included a French-Canadian, a Greek, a Kenyan, a Norwegian, a Costa Rican, and four Americans. The Vindicators of the Whateley Universe. Their current line-up includes a Swede, a Dane, a Belgian, a Canadian, and two Americans. For that matter, Pan-Asia, which is made up of Whateley Academy students from all over Asia, including Japan, China, and Vietnam. Eddie at The LMV: The LMV have a line-up of three black, two white, one Eastern-Asian, and an Ambiguously Brown.